WHAT appeared at the time to be a farcical change of manager the week before the new season had a happy ending as Mick Cooke steered Drogheda United to Premier Division safety in 2011. The year began with a stark reality check as then manager Bobby Browne received confirmation that the team would be virtually 100% amateur as the club sought to learn lessons from the past and live within its means. At the same time, it was announced that shares in a new company which would acquire and take over the running of the club would be sold at €100 each to help alleviate a shortfall in the 2011 budget, raise €200,000 over two years and give shareholders more of a say in how Drogheda United was run. One week later, however, the club issued a warning that it was on the brink of extinction for the second time in two years, because there was no one willing to underwrite €200,000, as demanded by the FAI who wanted all clubs to show that they could meet their obligations for the season. Part of the problem was that revenue projections were well down on 2009 because of the recession and Drogheda's relegation to the First Division. A lifeline was about to materialise, though, with Sporting Fingal going out of business after a financial meltdown. Drogheda, who finished bottom of the Premier Division the previous November, were always deemed 'first in line' to be parachuted back into the top flight if any other club went to the wall, and the Boynesiders were only too pleased to accept such a gift. Browne admitted to being 'wary' about going into battle with a First Division budget, but he needn't have worried as 11 days later he was out of a job! In an extraordinary sequence of events, Browne was sacked six days before the start of the season and another former Drogheda player - Cooke - appointed after ending his seven-year stint in charge of Monaghan United. Cooke was the Drogs' sixth manager in little more than 10 months, and was joined by another former United Park favourite, Robbie Horgan, as assistant. With precious little preparation, it was no wonder that - for the fourth consecutive season - the Boynesiders made a losing start to the season, going down 1-0 at home to UCD. Alan Mcnally was the only survivor from 2010 in the starting line-up. Drogheda lost by the same scoreline at Bohemians the following week, but already the supporters were voicing their approval about how well-organised Cooke's men appeared. And that sense of optimism looked justified when the Boynesiders held Derry City to a 2-2 draw in round three, coming back from 2-0 thanks to quick-fire goals from Colin O'brien and David Freeman. But a subsequent disappointing defeat at Sligo meant Drogheda ended the month bottom of the table, and April began with a 4-0 reverse at home to Shamrock Rovers. It was the Boynesiders' heaviest home defeat since they lost 5-0 to Longford Town in September 2003, early in Paul Doolin's reign. A point at home to fellow strugglers Galway the following week failed to lift the sense of gloom, and a 2-1 defeat at high-flying Bray in mid-april could easily have been 6-1 if the Seagulls had taken their chances. By the third week of May, Cooke's men had also lost to Dundalk, St Pat's, Bohemians, Sligo, Derry, Shamrock Rovers and UCD to make it seven defeats on the bounce - with an EA Sports Cup exit to boot - but despite the Drogs taking two points from a possible 42, the club's board remained patient, believing the manager would turn things around. A 2-1 win at Galway - Drogheda's first league victory for 30 matches, dating back 10 months - provided a glimmer of hope, with Mark O'brien netting the winner. That was reinforced by a 4-0 FAI Cup third-round victory over Mervue, although three of the goals came in the last 12 minutes and the result was flattering to the Boynesiders. The real breakthrough came when Philip Hand's stunning free kick strike secured a 2-1 win at Dundalk, ending the Lilywhites' unbeaten home record. Then Tiarnan Mulvenna scored twice on his home debut in a vital 3-1 win over UCD - Drogheda's first home league win in almost exactly a year. But the top sides were still proving to be in a different league, and the Boynesiders failed to score in any of the comfortable defeats at the hands of St Pat's, Derry, Sligo and Bohemians during the summer months. However, they were extremely unfortunate to lose 1-0 to Shamrock Rovers as Gary Twigg struck in the 95th minute - scoring for the sixth consecutive time in league encounters at Hunky Dorys Park. 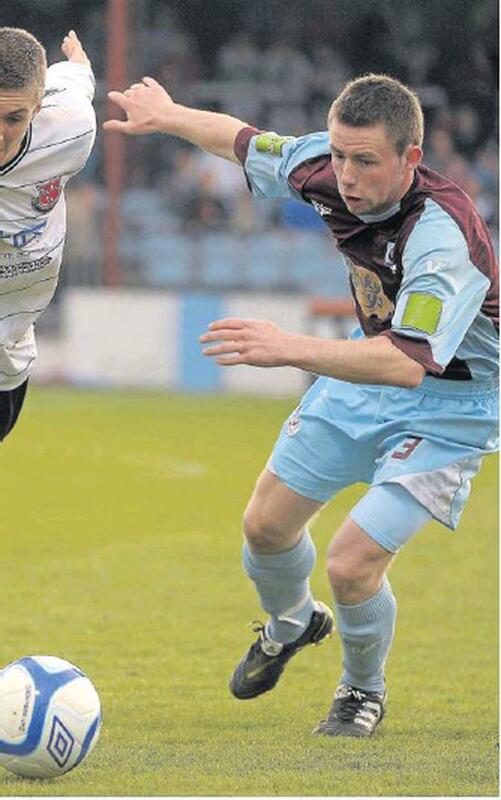 Heading into the final 10 matches, Drogheda led Galway by six points in the battle to avoid the relegation play-off, and with new signings Dave Rogers and Lee Lynch adding bite to the defence and midfield respectively, Cooke was optimistic. And the Boynesiders' Premier status was all but secured when Mulvenna struck again and they kept a clean sheet for the first time in 13 months - beating Galway 1-0. When Drogheda defeated Bray at the start of August, the manager was talking up their chances of overhauling eighth-place UCD. Dave Rogers scored his first league goal in four years to help secure an exciting 2-2 draw with Dundalk in one of the games of the season, but the Lilywhites knocked their neighbours out of the FAI Cup after a replay. Then there was an extraordinary match at the Belfield Bowl where the Drogs came back from 2-0 down to lead UCD 4-2 with 10 minutes left - and still lost 5-4! At least they held on for a superb point against Derry at The Brandywell after leading 2-0 in that game, and already there were indications that Cooke would stay with the club for 2012. Successive defeats by Bohemians and Sligo Rovers meant Drogheda's Premier status still wasn't mathematically secure, but when Galway were humbled 7-1 by Sligo in early October, Drogheda were safe with four games to spare - despite themselves losing 4-0 to championsto-be Shamrock Rovers. The Boynesiders confirmed their superiority over Galway with a 2-1 win at Terryland Park, although the winner was an own goal, scored after Drogheda had Alan Mcnally sent off. Cooke had called for squad members to 'play for new contracts' in the remaining games, but there was little sign of that in a 4-1 home defeat by Bray, where the Seagulls scored all their goals in the first 37 minutes. With nothing but pride at stake, the final Louth derby of the season drew a pitiful crowd of 703 to Oriel Park, where Johnny Breen's early goal proved enough to give Dundalk the bragging rights. Confirmation that Cooke had signed a new two-year contract followed, and the season ended with a flourish as Dinny Corcoran scored twice - including a spectacular winner - in a thrilling 4-3 win against St Pat's. The manager had more good news afterwards as he confirmed that Drogheda's budget for 2012 would increase. By the second week of December he already had eight players signed - including the Rathmullen brothers Sean, Ryan and Gavin Brennan - and the prospects for the new season look bright.